You're going to put surveys in holiday gifts this year, right? Well, if you're as customer-centric as Avinash Kaushik, Analytics Evangelist for Google, you just might. And next year's gifts will be even better. 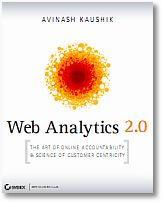 Avinash has just published Web Analytics 2.0: The Art of Online Accountability and Science of Customer Centricity, also at http://tr.im/akweb. It looks to be a fantastic read by one of the foremost web analytics practitioners and teachers, who is seeing an undeniable evolution of web technologies and online trends, including social media, video, and mobile. "Web Analytics 2.0 is: the analysis of qualitative and quantitative data from your website and the competition, to drive a continual improvement of the online experience that your customers, and potential customers have, which translates into your desired outcomes (online and offline)." From this framework, he explains how to do web analytics correctly, starting at the best place of all - choosing the right tools (aka, the beginning). As you read, pick any chapter, and you'll emerge an adept at an element of web analytics, from the basics of tracking your site, to analyzing visitor clickstream, to SEM and SEO. But he goes way beyond this, discussing the practices of competitive analysis, website testing, surveys, using and tracking social media. And he even gives practical tips for working in the industry, including what statistics you might want to know. The book is written in Avinash's clear style, including charts and screenshots. If you've ever had a conversation with Avinash, you know that you'll come away enriched about our industry and practice. I remember speaking with someone who reported to him at Intuit, who said that she learned more about web analytics in her first half hour one on one with Avinash than she had in her entire career before that. For instance, we recently launched 20 goals, up from 4, per profile. Avinash has been speaking about the importance of tracking many goals, what he calls micro-conversions, for a while. Take a read to get an expert practitioner's view. And on top of the incredible content in the book, Avinash is donating 100% of the proceeds from sales of the book to benefit The Smile Train and Ekal Vidyalaya. To read more about the book from Avinash himself, take a look at the announcement on his blog.